In my last international flight in September, I was delighted to read the interesting views about "how do we keep our heritage alive" expressed by the travel 3Sixty° team that was published in the in-flight magazine. I loved what Sub Editor Gregory Basil has shared about Odissi dance- that he was spellbound seeing Ramli Ibrahim's show named "Spellbound". Ramli Ibrahim is a Malaysian, who performs Odissi with his troupe. As I belong to the state of Odisha of India, I could immediately connect with the above views. Odissi dance is a treat to the eyes as it is very graceful and captivating like poetry or sculpture in motion. In the same international flight, one gentleman was dressed in traditional clothes and had a Kotpad shawl of Odisha. My sister guessed his identity as an Odissi dancer. When I went ahead and struck up a conversation with him, I realized that she was indeed right. I was delighted to find that we were traveling with the Guru (teacher) of Ramli Ibrahim! It was wonderful to meet Guru Gajendra Panda, who was returning from Kuala Lumpur after their latest show called "Ganjam" that was from 25-27 September 2015. Guru Gajendra Panda belongs to my hometown and yet I had never met him before. I informed him about the publication and read out the nice words about their show- Spellbound from the magazine for him. Sensing our enthusiasm, he promised to invite us for future dance programmes. 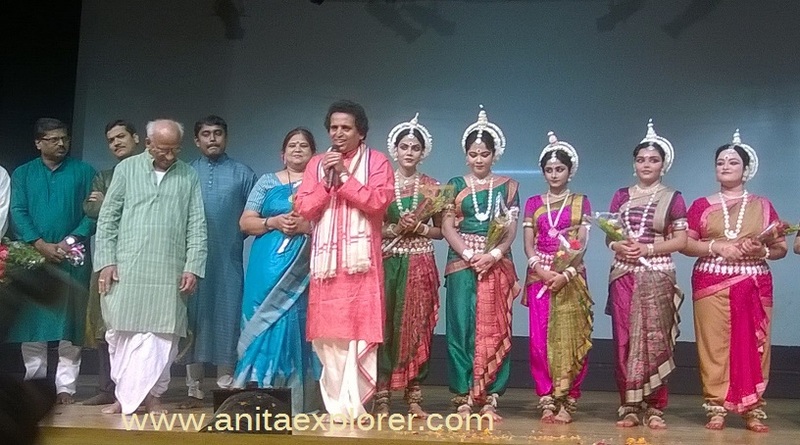 Glad that he invited us for his latest show that was dedicated to his Guru Debaprasad Das and was held in Rabindra Mandap, Bhubaneswar from 28-30 October 2015. We felt blessed that we could attend the rich classical dance and music event- Tridhara's 9th Guru Debaprasad Das Award festival in Bhubaneswar in Odisha, India. I felt rich as on the same flight I encountered an Odissi lover (Gregory Basil's views in the magazine!) and an Odissi teacher. Thanks to the meeting, I earned an invitation for this event & will hopefully receive for future ones as well! 2. not struck a conversation with the artist- Guru Gajendra Panda. 3. not been keen about Odissi. Travel gifts us such precious moments. Sometimes we get to meet people of our hometown outside our hometown! Such chance encounters are a profitable treat! I believe God decides such meetings. However, if we don't communicate or network, we may lose out on the opportunity to connect. I was always proud and keen about our arts and culture, and now I am even more! Like Gregory, even I have started attending more classical dance festivals! We must keep attending such functions and encourage our artists. Art needs art-lovers and patrons. May our rich heritage survive and thrive. culture and tradition when come face to face is such a delight. Reading your post gave me the goosebumps, Anita. Last Year i had this brilliant opportunity of witnessing Sujata Mohapatra and Srjan of Bhubaneshwar perform at Ananya Dance Festival. This was held in Purana Quila. And because personally i am so fond of Odissi i was so overwhelmed/ mersmerised with the music/ dance Anita that i have no words to express my emotions. Her lyrical movements perfectly epitomise the grace and technical perfection of the Gharana. She has performed all over the world as a soloist. Has won so many awards as you must be aware. i did not get the opportunity to see The Guru jee. But i consider myself blessed that i belong to this country which has the Shishya of The Guru, late Padma Vibhushan Kelucharan Mohapatra carrying forward the great culture and tradition. Also now that you mention i will be alert on the performance of Guru Gajendra Panda and his troupe if and when they perform in Delhi. Thank you so much for this post. Its incredible indeed..lucky you Anita. I also love your twitter handle on Orissa culture. How wonderful, this entry, your passion speaks for itself. Thank you for participating in this weeks challenging meme, hope to may welcome you again next time! Happy to hear that your chance encounter lead to such a beautiful opportunity. Keeping history alive is a challenge! Besides of course your lovely intro to Odissi it is your three takeaways that made me smile the most :) Travel is the best thing ever! Anita, Its been long I heard about heart whelming interest to restore the culture. By this article it proves, it still does ! Great Job! I have hardly seen you two cents on my stories. Do stop by there as well !